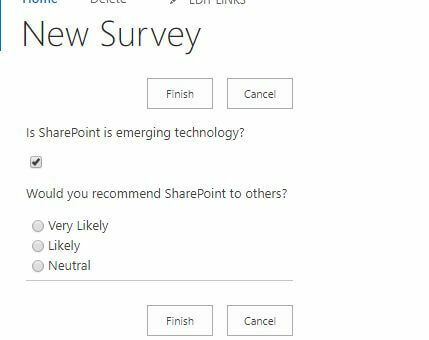 In this article, you will learn how to create a Survey list in SharePoint and how to manage it. 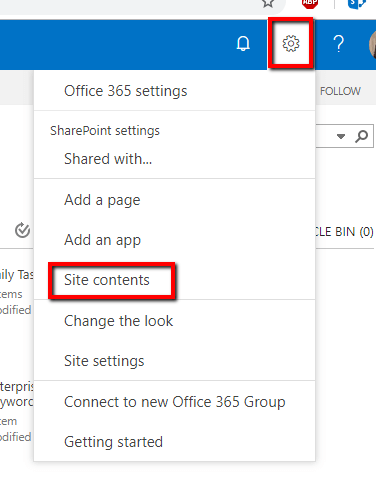 This article is the 44th part of my SharePoint series. Here are my previous articles. In the previous article, we saw how we can use an Issue Tracking list template in SharePoint to manage our issues related to any product. We have also seen the scenarios in which we can make use of Issue Tracking in SharePoint. Now, in this article, we will explore SharePoint Survey List template. Here, I will cover the following topics. How to create Survey List? “A Survey is a process of collecting the response of multiple people for same situation or same scenario”. Ultimately, survey is the process to collect data from people so that the data can be processed to produce some information that is further used to provide you with the products and services based on your interest. How likely you would like to recommend C-sharp Corner website to your friend? How much time on an average you spend on CSharpCorner website? etc. The power of the survey is its multiple choice questions where you are allowed to pick one or more answers for a particular question. Most of the surveyor also include some descriptive questions where you may have to answer by writing your own views. Mostly, every survey form has a field for comments. Once the data is collected, the surveyor processes that data to produce the information and collect the counts of the responses for each question and many more. If we want to replicate this whole scenario into our organization having SharePoint, we can simply use a Survey List template available in SharePoint. Let’s understand what a Survey LIst Template does and how to use it. Survey List template in SharePoint allows the users to create and manage the survey into an organization. The user can create a survey for its users, can configure it, and can ask for the response. It also allows the creator to view the statistics based on the responses given by other users. The very important factor to be considered is that you cannot create multiple surveys using a single survey list. If you have multiple survey topics, then you have to create a new survey list for each and every topic. Hence, it’s better to have a plan for the survey before creating the list. Let’s understand planning of Survey List in SharePoint. Before creating any survey, you should first plan it. The planning may need answers to the following questions. How many questions should be included in the Survey? How many of the questions should have answers required? What should be the answers types such as short text, long descriptive text, or some multiple choice answers? Does the single user allowed to submit multiple survey or not? These are some predefined questions which you should plan before designing any survey. 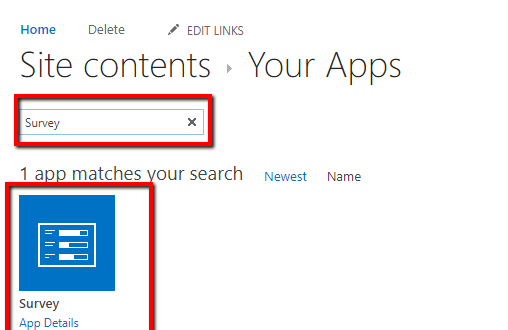 Let’s move on how to create a Survey List in SharePoint. In order to create a Survey list, please follow the below-given steps. Open the Site Content page by clicking on the "Settings" icon and then clicking “Site Contents”. This will open the "Site Contents" page. Click on the “Add an app” icon from this screen. Search for the “Survey” into the search box and then click on the “Survey” icon link. Give the name to the Survey List and hit the “Create” button. Your Survey List will be created in your site content gallery. Here, you can note that Survey list has its own identification icon. Click on the “New Survey” list and open the default view of the Survey List. Let’s understand the components on this page. When you have created any survey, then on clicking this link will allow you or your users to answer the survey. This has further 3 options - Export to SpreadSheet, View RSS Feeds, and Alert Me settings. If you want to configure any of the options, then you can use these actions. This is the key point of Survey List. It has options which allow the users to add questions to the survey and manage the settings of Survey list. This will display the survey data in a graphical view. This will display all the responses for the given survey. Also, you should have noticed one thing -- that it does not have any ribbon action. The Survey List does not have any ribbon actions because its actions are limited and are covered in the above listed points. In order to add questions to the Survey List, please follow the below steps. Open the Survey List and click on the “Settings” link. Here, you will have an option as “Add Questions”. When you click on “Add Questions”, an "Add Question" form will be opened and you will have the following options to fill up. Question: Enter your question text here. The type of answers to this question is: This will be an answer type. If you want to take a short answer from the user, then you can use Single Line Of Text, or else if you want to provide your user to select any one option amongst 4, you should use the column type as field type. New Question: If you want to add more questions, then please click on “New Question”. This will save the current question data and open up the same Add Question form again. Finish: If you have created all your questions for a Survey, click on the “Finish” button to save the Survey List data. In order to respond to a survey, we have to click on “Respond to this survey” link given into the list view of Survey list. Once you click on “Respond to this Survey”, it will open the following form which will allow a user to enter the response. Here, you can see that the user is allowed to choose the answers. Once the user is done with the selection, he/she has to hit the "Finish" button and submit the survey. As soon as user submits any survey, the count of responses is automatically increased to actual number of response submitted. Now, if a user clicks on “Show graphical summary of responses”, the responses will be plotted on the graph and displayed over the screen, as shown in the below figure. In general, a single person sees a survey for only once. It is not required to submit the same survey again and again. So, in order to control multiple responses from a single user, SharePoint has its own configurations. 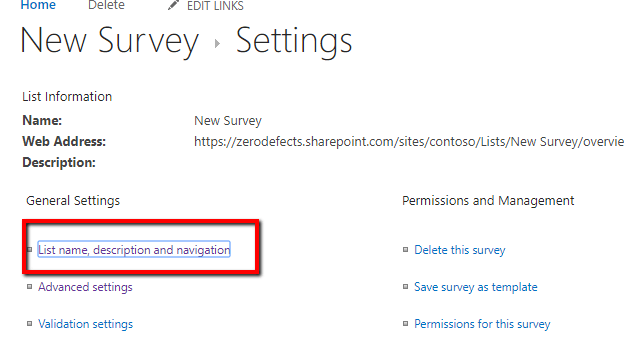 In SharePoint, you can control whether the users are allowed to respond to the survey multiple times or not. In order to configure this, please do follow the below steps. Open the Survey list. Click on “Settings” and then click on “Survey Setting”. Now, click on the “List name, description, and navigation” link. Scroll down to find the option as “Allow multiple responses?”. Check “Yes” if you want to allow users to submit the survey multiple times; else select “No” and click “Save”. 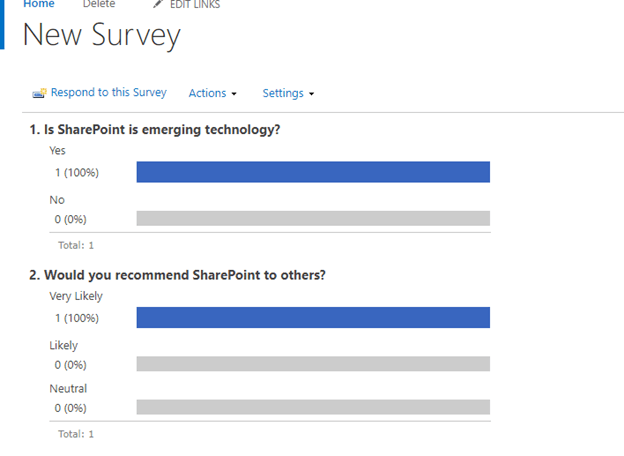 So, in this article, we have seen what a survey is and how we can create a survey in SharePoint. Also, we looked into the configuration of the survey so that we can control whether the survey should allow the same user to respond multiple times or not. If you have any questions or confusions, please do let me know in the Comments section. In the next article, I will explain Tasks List in SharePoint.